Meyer lemons are native to China and thought to be a cross between a lemon and a sweet orange. The Meyer lemon was first introduced into North America in 1908 by a United States Department of Agriculture (USDA) employee named Frank Meyer. Meyer lemons are a little sweeter and less acidic than true lemons. The flesh of this lemon is more orange than a true lemon. Meyer lemons are grown in China as a potted ornamental, but have become popular as a food in the United States. 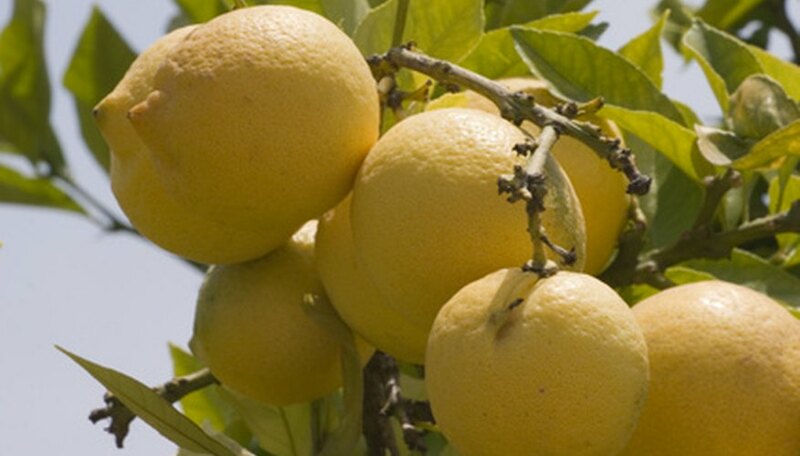 Because it is hardier than many other citrus crops, Meyer lemons grow well throughout Florida. Select a location for your tree. Meyer lemon trees can grow to between 6 and 10 feet tall and require full sun. They need full sun, but can sometimes grow in partial shade. Select a sunny location with soil that drains well. Remove your young nursery tree from its nursery pot. In some cases, you may need to loosen the roots from the side of the pot with a shovel. Dig a hole slightly larger than the width of your Meyer lemon tree’s root ball. Dig the hole slightly shallower than the root ball. This will allow the root ball to create a bump to encourage drainage away from the tree’s trunk. Place 7our tree in the hole and backfill the hole with at least 2 inches of soil over the top of the root ball. Cover the root area with mulch to reduce moisture evaporation from the soil and to discourage weed growth. Give your newly planted Meyer lemon tree about 5 gallons of water per week split between 2 or 3 waterings. After your tree is established, reduce the frequency of watering, but keep the amount the same. Give your older tree 5 gallons of water once a week. It is especially important to give your tree adequate water when fruit is forming on the tree. Remember that lemons are primarily water.